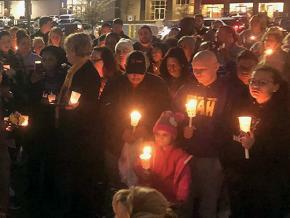 In October, two Black grandparents were gunned down by a white supremacist in a Kroger supermarket in Louisville, Kentucky, sending shock waves through the Black community. The shooter was recorded on surveillance video trying to get into a predominately Black church just before the killing. Michelle Randolph, who teaches fourth grade in a school with a majority of Black and immigrant students in Jefferson County, Kentucky, lives in the neighborhood and shops at the Kroger that was targeted. Randolph helped organize the over 5,000 Kentucky educators who shut down schools in 30 counties and rallied with students, parents and unionists on the state Capitol for education funding. Kentucky educators were part of the “Red State Revolt,” which included strikes that shut schools down in more than five states dominated by Republican legislatures — including West Virginia, Oklahoma, Arizona and North Carolina — and won many millions of extra dollars in education spending for their school districts. 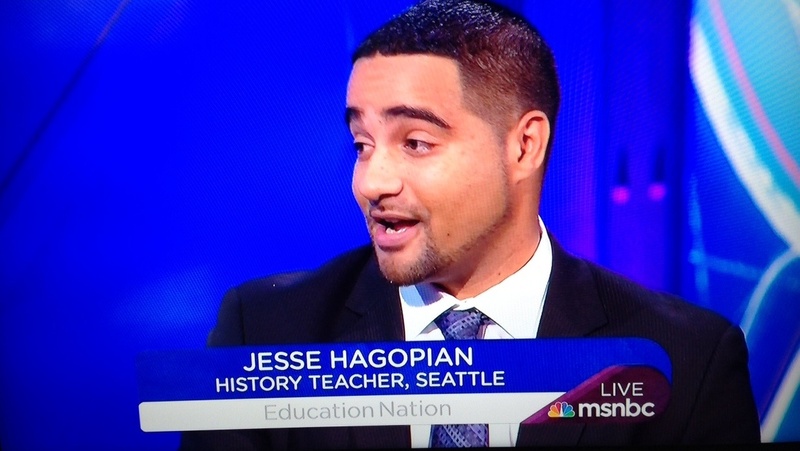 Jesse Hagopian, a Seattle high school ethnic studies teacher and co-editor of the book Teaching for Black Lives, interviewed Michelle on the fight against racism and the struggle for education in an article that first appeared in Socialist Worker. Jesse: Thanks for taking the time to talk after a long day in the classroom. Jesse: I wanted to first ask you about the recent escalation of racist, hateful violence. There were the mail bombs sent to political opponents of Trump. Then there was the attack on the synagogue that killed 11 people, which has been called the deadliest anti-Semitic attack in U.S. history. And in the midst of these, there was the racist killing of two Black grandparents in Kentucky, Maurice Stallard and Vickie Lee Jones, while they were doing their weekly shopping at the Kroger supermarket. Tell me about the impact of these shootings on you and on the people of Louisville. Michelle: My first job was working at that Kroger. That’s how close my family and my parents live. I think the first thing you have to recognize about this violence that you see is that people are feeling emboldened to take violent action against things they feel are threatening. I will not name the shooter, as to give any recognition to him and what he’s done. But he’s not the only person who pulled that trigger that day. There were several people who had a hand and played a part. That’s the climate of our country right now. We have people in office, in the state of Kentucky, who support people who are against equal rights. They’re against fair pay. They’re against supporting educators and students of color. They make comments from the highest office in the land that embolden dangerous people. These were two grandparents who paid their dues. Who went to church. Who raised awesome families. Were productive citizens in their respective communities. I know Mr. Stallard was in fraternity. It’s a violent and very sad reminder that it’s everywhere. There are no neighborhoods to move to if you Black. Jesse: It’s dangerous being Black. Michelle: Yeah. There is no area of town that shields you. There’s no membership to an organization or regular attendance to church. There’s nothing that can shield you from this level of hate. Jesse: In Trump’s America today, we’re seeing that over and over again. Horrifying. And don’t you have a connection to the family of the people who were killed? Michelle: A friend of mine, his grandmother was the woman who was slain. Jesse: I’m sorry for your loss. Michelle: Thank you. The gentleman who was slain, his family lives literally behind my family. They’re all in the same area of town. Shopping in the same places. Seeing each other. Just in the neighborhood. Jesse: How are people being impacted by these murders in your community? Michelle: I would say that the people in that area of town are on high alert — including my own husband. He does not want me and the children to go into a grocery store alone anymore. I’ve seen people go into that grocery store, people of color, and walk in with a look of fear. I’ve seen people break down crying in that grocery store. They are just trying to live what you would think of as a normal life — everybody has to go to the grocery store, right? This is the store five minutes away from my childhood home. My parents still live in that neighborhood. When I go in any grocery store, I can’t go in there without looking at anybody and being on high alert, thinking, “Am I going to be somebody whose life is cut short because they feel like I’m in the wrong area of town shopping for grapes, bananas and oranges?” I want to be able to go in the grocery store without fearing for my life. There’s an epidemic going on across the country where you can’t do anything while Black. You can’t go to church. You can’t study in a dorm. You can’t walk into your own house. You can’t go into the grocery store. You can’t go to school. It’s a growing list of things that are deeply affecting the psyche of Black and Brown people. And this is especially happening at school. Black and Brown kids see what is happening to people that look like them. Now kids are asking, “Is there something wrong with being like me?” You have to have those very real and very transparent conversations with your students to let them know that they are not the problem. Jesse: Are those conversations happening in the schools right now? About what happened with these killings and about the state of race in America? Michelle: I am, definitely. As an elementary teacher, with fourth graders, we have touched on it. But across the schools I don’t think there’s been deep conversation about it at the elementary level. I do think more conversations are starting to happen amongst staff and employees. The Jefferson County Public School district held their 2018 Equity and Inclusion Institute today. I attended, along with every teacher at my school. They talked about doing more culturally responsive teaching. And they began the conversation about understanding what the school-to-prison-pipeline really is. How your own implicit bias is connected to how you treat your students of color and your minority students in your classroom. I think we are slowly, within our particular district, trying to inform and educate those teachers and administrators who have such a diverse district to work in. However, I feel that we are very slow in moving there. I don’t even know if that conversation has been started across the commonwealth. That’s a fear that I have. Jesse: For sure. Like you said, we’re in a state of emergency where Black people are living in fear and being terrorized. What we’re hearing from the president is that the real threat are some migrant families who are fleeing violence in their homeland and trying to come here to America. But what we need to be talking about is the threat of white supremacy. Jesse: I was listening to Democracy Now! this week. I heard Kentucky Rep. Attica Scott interviewed. She made a point that struck me. She said that the recent gang bill that passed in Kentucky contributed to this climate of hate and fear and racism. Jesse: I wanted to get your opinion on that, if you could tell us what the bill was and how you think it may have contributed to this climate of hate. Michelle: Sure. HB 169, or the gang bill, allows police to have an easier pathway to recognize a group of youth, or people, as a gang. It broadens the definition of criminal gangs, which gives them the opportunity to label any activity that maybe this said group of youth is doing as gang activity. It also allows them to prosecute with harsher penalties if they’re involved in said gang activity. Now you have created a climate not only where some people feel like the police serve as their personal security, but they can now call the police without any proof or evidence of wrongdoing and accuse youth of gang activity. I don’t know any teenager that doesn’t like going to the mall, or walking around the mall and hanging out. But you’ve created this culture and this climate to where you’ve made these students unwelcome. And it’s not even just at the mall where this is a problem. A lot of people don’t know that Jefferson County is one of the most integrated school districts in the country. That is because of busing. Students are being bused from the west end — which is the predominantly Black neighborhood — all over the county. Some areas are far east. If those students are getting out of school, they could literally just be walking to a gas station or walking to the public bus stop and someone could feel unsafe and call the cops. Jesse: The BBQ Becky phenomenon on steroids! I heard that in Mississippi, where they passed an anti-gang bill, in the eight years since it’s passed, it’s only Black people that have received the enhanced sentences from the gang bill. Michelle: Absolutely. And just this year, a state of the art $500 million federal prison has been approved to be built in Eastern Kentucky, so it makes sense. If you have your eyes open, it makes sense that they would start targeting Black and Brown youth so they can fill up this prison. Now, there is a growing group that’s being suspended at a much higher rate than all the other demographics in our school district. Black girls. There’s a new shift to where now not only Black boys, but Black girls are getting these labels and they’re being suspended at a much higher rate than their white counterparts. Now they are starting to surpass the rate of suspension for Black boys, which is unbelievable. Jesse: I read a really powerful book called Pushout by Monique Morris, who writes about the phenomenon of Black girls being suspended. It is something we really have to work to end. The racist narrative of the dangerous Black teen is coupled with the sexist narrative of the angry Black girl and now Black girls are suspended at some seven times the rate of white girls nationally. Jesse: When you were on strike last year you were part of an effort to talk to teachers about taking up the issue of the gang bill and argued that educators shouldn’t just take up the bread-and-butter economic issues, but also the question of racism. I was really moved by your leadership on that. Michelle: It’s really clear for me. I live in Jefferson County. We have such a diverse population in Jefferson County. Just based off of what I saw in the bill, I knew that it would directly target Black and Brown students in our district. The gang bill is one of those things that, if you allow that to pass, if you allow that to go without a fight, without a struggle, then which group is next? Which group will they target next? Yes, we definitely want to fight for our pensions and our benefits. All of those things are very important. But how can you, as an educator, then go back to your school and look at those Black and Brown children in your classroom and teach them the basics and not vote in their interest? They need our support to dismantle the school-to-prison-pipeline. As educators, if we’re not advocating for our students, then we’re missing part of our responsibility. Jesse: You’re right, we have to start talking about the emergency of the school-to-prison-pipeline. I just saw a viral video from a school in Kentucky where the Kentucky sheriff was handcuffing third grade boy. He had to slide the handcuffs around the biceps of this kid because his wrists were too small. Cuffing his arms behind his back! It turns out this officer had been cuffing Black and Latino students routinely. Students with disabilities. Verbally berating them. They just won a $337,000 settlement for this painful and unconstitutional treatment of students. Of course, a settlement isn’t justice. It isn’t accountability for this officer. I wonder how this policing of students fits into the school-to-prison-pipeline you’ve been talking about. Michelle: I think it fits because, when you automatically label Black students as loud and disruptive and this is the mindset you come to school with, then your thought process is, any time you see them doing something, you’re going to think negatively. We, and I’m including myself because I am guilty too, educators, are weaponizing “The Office.” Threatening our children with “The Office” if they don’t follow instructions, are constantly disruptive and engaging in inappropriate behavior. We treat it like the BBQ Beckys [use the police] sometimes due to lack of time and or resources to work with a students who are acting out. That leads to referrals. After so many referrals, that leads to suspensions. Those suspensions then lead to loss of instructional time. Because of their loss of instructional time, they tend to either fall back severely, within their own academics, or eventually get to the place where they’re old enough to where they’ll dropout. Instead of adding more security and more police in the schools — and more systems in place to where students are having referrals that lead to suspensions — they should be putting that money and resources into behavior coaches and restorative justice programs. How about some counselors? Jesse: Thank you! I just read a story that said there are 1.7 million students in this country that go to a school where there’s a police officer but no counselor. That was appalling to me. That leads me to ask you about the Black Lives Matter at School movement that erupted in over 20 cities last year and is gearing up again for a week of action from February 4 through 9 for this school year. What are your thoughts on this movement? Michelle: I think it’s an amazing initiative. Black Lives Matter at School is not just creating some type of program where kids learn a few Black history facts and that’s it. They’re actually building a movement across the country. People who work in education. People who work in policy. Students. Parents. They’re taking the opportunity to look at some things that we can change systematically within education. This movement is saying we need to start mandating that we include Black and Brown culture and history classes at school. There’s no reason that you have a particular demographic at your school and you never touch on their history. You never touch on their contribution. You never touch on who they are. The blood that runs through their veins. How the people who came here before them helped build what they are now standing on. I think the Black Live Matter at School would be an awesome initiative for Jefferson County and the state of Kentucky. I think that Jefferson County has started, like I said before, trying to incorporate more culturally responsive education. But I think, if they were to eventually team up with the Black Lives Matter at School, that it would create another opportunity to reach those students who feel like their voices aren’t heard. Jesse: Right on. Speaking of making your voice heard, I was just amazed by what you and your colleagues accomplished last school year by raising your voice and taking action for education justice. You were part of a historic strike wave in this country that showed the labor movement what’s possible and showed educators, who have been suffering with underfunding for so long around the nation, how to struggle and how to win. Talk about what that movement meant to you. Michelle: I think the first thing for me was having my voice out there on behalf of my students and for my own kids. I have two kids that are in the public school system right now. I’m a product of the same public school system. So is my husband. We’re not saying things just to be saying them. We wholeheartedly believe in the public school system and believe that it can be better with proper funding, proper support and proper implementation of laws that support our youth and the people in our commonwealth. I think that the strikes that happened were because people felt empowered. People were starting to feel like maybe we can really do this. Maybe, if we work together, we can stop these injustices; There’s no good reason for having one school receive only $2,000 to spend per student, but in the same county, $8,000 is spent on each student in another school. This goes back to making sure not only that we have people in Frankfort [capital of Kentucky] who have our best interest, but it also goes back to holding them accountable. I think that’s where we have the most work ahead of all of us across the country. I’ve been blessed to meet so many instrumental people across the country who led strikes in their respective states. One thing we all saw that was in common was everybody felt that they needed to be on one accord. Everybody came together as a unit. I think now we have to move towards continuing to hold politicians accountable. Yes, tomorrow we’re going to be voting. Politicians will to let us know why we should vote for them. But once we vote, we need to make sure that we are still being active. We are still holding those people accountable. Not getting caught up in we got this particular party in office, so everything’s all good now. As Black people, as minorities, as people who have a low socioeconomic status, we can no longer afford to think that voting a particular color has anything to do with us having some type of upward mobility in this country. We have to come together and work together and struggle together, because it’s a fight. There are so many barriers in place to make you feel like there’s no way you can overcome the problems in our society. There’s systematic oppression and racism. Then there’s classism. You got all these different things that you feel are working against you whatever your cause is. Let’s come up with tangible ways to solve those problems. There is no magic bullet. There’s no magic candidate. It’s just not out there. We will have to struggle. Jesse: For sure. And I think that what you all did in Kentucky, joining the red-state revolt of educators across the country and shutting down entire school systems in states, revealed the power that was hidden in plain sight. We’re with our co-workers every day making the schools run with very little support and we often talk about how removed the politicians are from understanding the schools. On one level, know that it’s our labor that makes the school system work. But what you all did was make it explicit and demonstrate to everybody that no matter who’s in power in the halls of government, we make the schools run and we can shut them down until they agree to fund them. That lesson, I think, is invaluable. And now the strikes are spreading. We had a strike wave of schools districts here in Washington state. Now it’s looking like the Los Angeles educators are going to go out. Michelle: Yes! My connects in LA have been messaging me often. I’ve been giving them all my love and words of encouragement, because the people we’re up against don’t fight fair. It’s a struggle. It’s hard work. It’s dirty. It’s not glamorous. But it’s necessary. We are all in this together. Whether you’re in Chicago or Seattle or Louisville or LA, or you’re in Arizona or West Virginia, at the end of the day we really all want some of the same things. We want to live a nice life. We want to make sure our kids are safe and healthy and educated. It really comes down to the fact that community means all of us. The school to prison pipeline begins in the schools with the referral of certain students to “the office” and can be reduced with resources and counselors and restorative justice methods.